Stylish and functional! 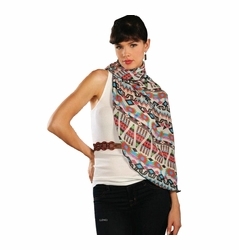 You'll love this beautiful summer weight gauze nursing scarf that will punch up any wardrobe. It comes in solid colors as well as tie-dye print. You can nurse in public with privacy or just wear as a fashionable accessory to compliment any outfit! Summer Weight gauze is perfect for those sweltering days when you want to have some privacy without overheating baby. Reno Rose's Pirose Motherhood is a revolutionary super light weight and multi-functional nursing cover that also works as a multi way fashion accessory and even a sunshade for the car seat or stroller. The Jordyn design features a sunny yellow and orange floral print which has been carefully chosen to act as camouflage for privacy while nursing. The light weight fabric is airy, providing comfort for both baby and mom. When finished nursing, Pirose's unique design allows it to transition into a fashion accessory as a scarf, a shawl, or a hair accessory to compliment any outfit. Reno Rose's Pirose Motherhood is a revolutionary super light weight and multi-functional nursing cover that also works as a multi way fashion accessory and even a sunshade for the car seat or stroller. The Gwendolyn design features a beautiful red and orange floral print which has been carefully chosen to act as camouflage for privacy while nursing. The light weight fabric is airy, providing comfort for both baby and mom. When finished nursing, Pirose's unique design allows it to transition into a fashion accessory as a scarf, a shawl, or a hair accessory to compliment any outfit. Reno Rose's Pirose Motherhood is a revolutionary super light weight and multi-functional nursing cover that also works as a multi way fashion accessory and even a sunshade for the car seat or stroller. The Emily design features a beautiful multi color aztec print which has been carefully chosen to act as camouflage for privacy while nursing. The light weight fabric is airy, providing comfort for both baby and mom. When finished nursing, Pirose's unique design allows it to transition into a fashion accessory as a scarf, a shawl, or a hair accessory to compliment any outfit. Reno Rose's Pirose Motherhood is a revolutionary super light weight and multi-functional nursing cover that also works as a multi way fashion accessory and even a sunshade for the car seat or stroller. The Ori design features a modern red and black print which has been carefully chosen to act as camouflage for privacy while nursing. The light weight fabric is airy, providing comfort for both baby and mom. When finished nursing, Pirose's unique design allows it to transition into a fashion accessory as a scarf, a shawl, or a hair accessory to compliment any outfit. Reno Rose's Pirose Motherhood is a revolutionary super light weight and multi-functional nursing cover that also works as a multi way fashion accessory and even a sunshade for the car seat or stroller. The Aya design features a lovely watercolor print in pinks and oranges which has been carefully chosen to act as camouflage for privacy while nursing. The light weight fabric is airy, providing comfort for both baby and mom. When finished nursing, Pirose's unique design allows it to transition into a fashion accessory as a scarf, a shawl, or a hair accessory to compliment any outfit. Reno Rose's Pirose Motherhood is a revolutionary super light weight and multi-functional nursing cover that also works as a multi way fashion accessory and even a sunshade for the car seat or stroller. The Minako design features a modern black and white floral print which has been carefully chosen to act as camouflage for privacy while nursing. The light weight fabric is airy, providing comfort for both baby and mom. When finished nursing, Pirose's unique design allows it to transition into a fashion accessory as a scarf, a shawl, or a hair accessory to compliment any outfit. Reno Rose's Pirose Motherhood is a revolutionary super light weight and multi-functional nursing cover that also works as a multi way fashion accessory and even a sunshade for the car seat or stroller. The Taeja design features a beautiful pink and lavender paisley print which has been carefully chosen to act as camouflage for privacy while nursing. The light weight fabric is airy, providing comfort for both baby and mom. When finished nursing, Pirose's unique design allows it to transition into a fashion accessory as a scarf, a shawl, or a hair accessory to compliment any outfit. Reno Rose's Pirose Motherhood is a revolutionary super light weight and multi-functional nursing cover that also works as a multi way fashion accessory and even a sunshade for the car seat or stroller. The Aya design features a beautiful leopard print which has been carefully chosen to act as camouflage for privacy while nursing. The light weight fabric is airy, providing comfort for both baby and mom. When finished nursing, Pirose's unique design allows it to transition into a fashion accessory as a scarf, a shawl, or a hair accessory to compliment any outfit. Reno Rose's Pirose Motherhood is a revolutionary super light weight and multi-functional nursing cover that also works as a multi way fashion accessory and even a sunshade for the car seat or stroller. The Gabrielle design features a beautiful green leaf print which has been carefully chosen to act as camouflage for privacy while nursing. The light weight fabric is airy, providing comfort for both baby and mom. When finished nursing, Pirose's unique design allows it to transition into a fashion accessory as a scarf, a shawl, or a hair accessory to compliment any outfit. Reno Rose's Pirose Motherhood is a revolutionary super light weight and multi-functional nursing cover that also works as a multi way fashion accessory and even a sunshade for the car seat or stroller. The Aya design features a stunning blue and green paisley print which has been carefully chosen to act as camouflage for privacy while nursing. The light weight fabric is airy, providing comfort for both baby and mom. When finished nursing, Pirose's unique design allows it to transition into a fashion accessory as a scarf, a shawl, or a hair accessory to compliment any outfit. 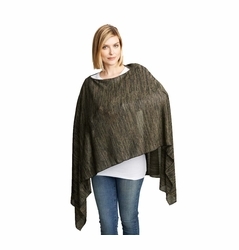 The Coperta Poncho works for both pregnancy and afterwards for breastfeeding. Made of a breathable, lightweight knit that is perfect for layering and won't overheat baby when used as a nursing cover. 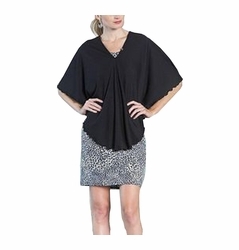 Full fit to accommodate a changing shape with a dropped shoulder and banded neckline. 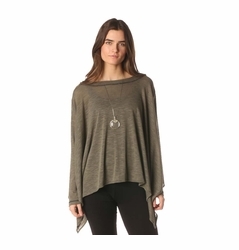 Long sleeves with a wide neckline. It's a scarf, and it's a nursing cover! We love this ingenious idea from Maternal America. If you are looking for a nursing cover that is a little more subtle, this is for you. 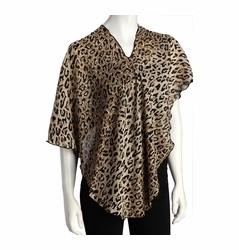 Wear it as a nursing cover for easy and discreet nursing then throw around your neck to wear as a fashionable scarf. Soft, lightweight knit fabric. Nursing covers provide new mamas with a very stylish way to discreetly breastfeed baby while looking fabulous! Summer and winter weight nursing scarves by Maternal America come in many solid colors and patterns and can be used as a stylish fashion accessory long after weaning. The JJ Cole nursing cover comes in three patterns that coordinate with other accessories such as shopping cart covers, car seat covers and diaper bags. Another popular breastfeeding option is the Bebe au Lait nursing cover that comes in over 20 different patterns to match any mama's unique style. Gift sets also available that include matching burps cloths and a nursing cover, boxed up to make a perfect baby shower gift. The newest brand in our line up, Hooter Hiders offers many fun and trendsetting patterns.